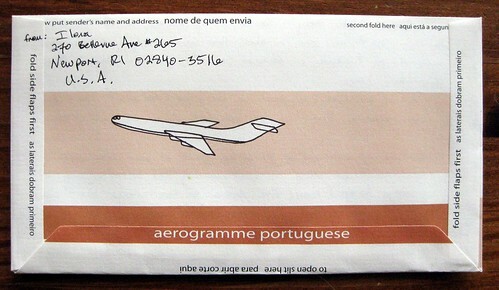 Here's another design from International Girl aerogrammes: it's charmingly called aeroplanes with eyeballs. Yes, I just did another International Girl aerogramme order - I really had gone through all the ones I ordered before, and I got a couple of new designs - or designs new to me, anyway. (I've blogged about these a lot before, if you want to see other designs.) I think the little eyeballs on the airplanes are pretty adorable, and this set has narrow-ruled lines which I really like. Someday I'll photograph those, too. Here's the back, which shows our eyeballed-aeroplane from a different angle. 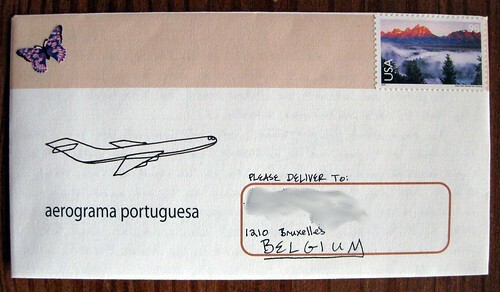 As is customary with the Int't Girl aerogrammes, each one has directions in a different language - this one is Portuguese. I used to think that aerogrammes were cheap - in a bad way. I hated using them to write to my penpals but I do remember enjoying slitting them open when we received a letter from my Uncle or Grandfather. You always had to write enough to fill the whole thing. I have no idea when they stopped making them but now I miss them.